WASHINGTON (Sputnik) - US President Donald Trump's decision to stop military exercises with South Korea without receiving verifiable commitments from North Korea is troubling, US Senators Patrick Leahy and Jeanne Shaheen said in separate statements. Jeanne Shaheen said, "It is especially troubling that President's Trump's pledge to end joint military exercises with the South Korean military seems to have come as a surprise to both South Korea and the Pentagon. "[I]t is troubling that the President has agreed to unilaterally halt military exercises with South Korea without verifiable commitments from North Korea to denuclearize while giving Kim the recognition he has long craved. So far all we have seen is a photo op coupled with a few broadly worded commitments," US Senator Patrick Leahy said. — Sen. Patrick Leahy (@SenatorLeahy) 12 июня 2018 г. 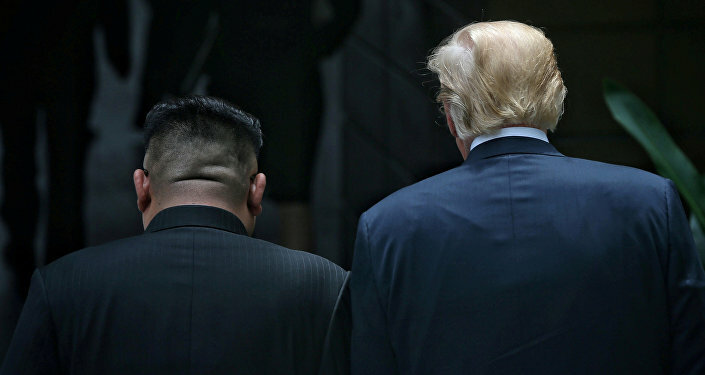 In a press conference after meeting with North Korean leader Kim Jong-un during their summit in Singapore earlier on June 12, Trump said it was inappropriate to hold "war games" while trying to negotiate a deal. Trump added canceling joint military exercises would both save money, and be appreciated by Kim.